Hallstatt is more than just a pretty town. It’s actually considered to be the oldest still-inhabited village in Europe, dating all the way back to the Iron Age. In fact, the early Iron Age culture from 800 to 400 BC is known as the Hallstatt culture, an era marked by farming and metal-working, long-range trade with Mediterranean cultures, and the rise of elite classes and social distinction. Hallstatt – which means “place of salt” – is home to the world’s first salt mine. Thanks to the salt industry, the town quickly progressed and became wealthy. Salt has always been an important commodity, more so in the pre-historic times as it was used to preserve meat. In recent decades, though, Hallstatt’s fame derives mostly from its natural beauty. Sandwiched between a lake and mountains (you could even say that it cuddles the lake), this perfect little town easily became a favorite tourist destination as well as a UNESCO World Heritage site. Nowadays, you’ll find a lot of tour groups making a daytrip to Hallstatt from Vienna, Salzburg, and even Prague and Cesky Krumlov. This influx of tourists further boosted Hallstatt’s economy, giving rise to tourist attractions and amenities. While you can see much of Hallstatt in just a day, I highly recommend staying longer. Spending the night in Hallstatt will also allow you to have it to yourself for a few hours in the morning before the arrival of day trippers at around 9 AM. The town may be compact – you can walk from end to end in under half an hour – but there’s much to see within the town and in the surrounding area. Spend at least two days to really see all of Hallstatt’s pretty corners. Put on your comfy shoes and a photo-op-worthy outfit – we’re going to explore Hallstatt! Even if you’re not a morning person, you’ll want to get up early for this town. Besides, you can just head to bed early as there’s nothing much happening at night. The mornings, though, are absolutely magnificent. Start at either end of the town. If your hotel is near the market square, the north end is nearer. If you’re staying outside town along Malerweg, you can start at the south end. Personally, I like starting at the north end because I love taking photos of the town in the early morning. By 9 AM, the town usually gets overrun by tourists, and you’re better off just exploring the other attractions. Walk all the way to the north, past the ferry station. When the road bends, look back and you’ll see this absolutely breathtaking view of Hallstatt. Most city tours all around the world include a visit to the cemetery – something I’ve never really appreciated as I’m not a big fan of graves. But the cemetery in Hallstatt is different! It’s actually uplifting (in a weird way) to walk through the cemetery grounds as each grave has its own small flower garden and a view of the lake – a fitting tribute to loved ones. By now you’ll see that you don’t actually have to do anything in Hallstatt. Just walking along the boardwalk, looking up at the pastel houses with their charming flowerboxes, and peeking into the souvenir shops is a great way to spend the day. Even better if you get to do this while the rest of the town is still asleep – so aim to be up and about by 7 AM at least. Make your way to the market square and weave in and out of the streets. Remember that Hallstatt is really small (just under 1 KM from end to end) so there’s no need to rush through. Take your time and enjoy! As if the calm blue lake and mountain ranges reflecting on it are not enough, Lake Hallstatt has to be inhabited by these gorgeous, photogenic creatures. I think they’re all vying for Instagram-fame, as they’ll pretty much pose demurely for you. When in Hallstatt, don’t skip the fish! Most restaurants (and locals you will meet along the lake) will offer to cook you fish, so definitely don’t pass it up. Almost every flower-decked house along the lake is photogenic. Just remember that these are residences and private properties so don’t go climbing up someone’s balcony! Always be respectful and keep your voices down, especially if you’re traveling with a lively group. You can visit the Tourist Information Center further down the road to learn about upcoming events or get brochures of the different establishments around town. Just a few steps past the Tourist Information Center, another bend on the road leads to another gorgeous view of the town. You’ll once again see the beautiful pastel houses you just passed by and if you’re lucky, a swan or two will join your shot. From the south view point, walk down a road to the left to get to the funicular. You can take a ride up and down the funicular to get to the top of the 1,030-meter tall Salzberg (Salt Mountain). Even if you don’t plan to visit the salt mine, the views from the funicular are well worth the trip. Once up on Salzberg, check out the “World heritage” views from the Skywalk. It extends over a sheer drop with the Hallstatt old town directly below. If you fancy a cup of tea with a view, stop by the Rudolfsturm restaurant. Now we come to Hallstatt’s star attraction, which I saved for the last. This 7,000-year-old salt mine tells the story of Hallstatt, with fascinating audio-visual presentations that will take you through the pre-historic era to the present. You’ll also get to wear overalls and slide down wooden slides like a legit miner, so it’s a pretty interesting experience. Find out more about the salt mine and nearby attractions here. End the day at one of the lakeside restaurants. If you have one more day in Hallstatt, explore the surrounding areas. Eating in Hallstatt is so much more special as the meals come with a view. Eat outside when the weather is good. Don’t forget to eat fish, as this is the town’s specialty. For the best fish dishes, eat at Seewirt Zauner – try their grilled whitefish, which is freshly caught from the Lake Hallstatt. For yummy Austrian desserts like apple strudels and other pastries, visit Cafe Bäckerei Konditorei Maislinger. For ice cream fixes, visit Gelateria Giovanni. By driving – I highly recommend driving to Hallstatt. You can get a rental car from Vienna and drive 3 hours to Hallstatt, or get your car from Salzburg, and it’s just a one-hour drive from there. Here’s a road trip itinerary that goes from Vienna to Salzburg through Hallstatt. From Vienna, you can catch a train that goes to Hallstatt via Attnang-Puchheim. Get your train tickets from the main train station (Wien-Hauptbanhof) or the west train station (Wien-Westbahnhof). The fastest train would take about 3.5 hours. Once at Hallstatt station (which is actually in Obertraun, across the lake from Hallstatt), you have to ride a ferry (Stefanie) into Hallstatt’s old town. You can get your tickets from the ferry station that’s just beside the train station. From Salzburg, there are two ways to get to Hallstatt. By bus: Go to the bus terminal outside Salzburg’s main train station (Salzburg-Hauptbanhof) and look for Bus #150 to Bad Ischl. Once in Bad Ischl, ride a train to Hallstatt, then the ferry to the old town. By train: From the Salzburg-Hauptbanhof, ride a train to Attnang-Puchheim, then switch to a train to Hallstatt. Once in Hallstatt station, ride the ferry to the old town. Hallstatt is a wildly popular tourist destination so if you plan to stay at least a night, make sure to reserve your hotels in advance. If you’re booking closer to your stay and find that most Hallstatt hotels are already fully-booked, you can also look at accommodations in Obertraun, which is directly opposite Hallstatt across the lake. 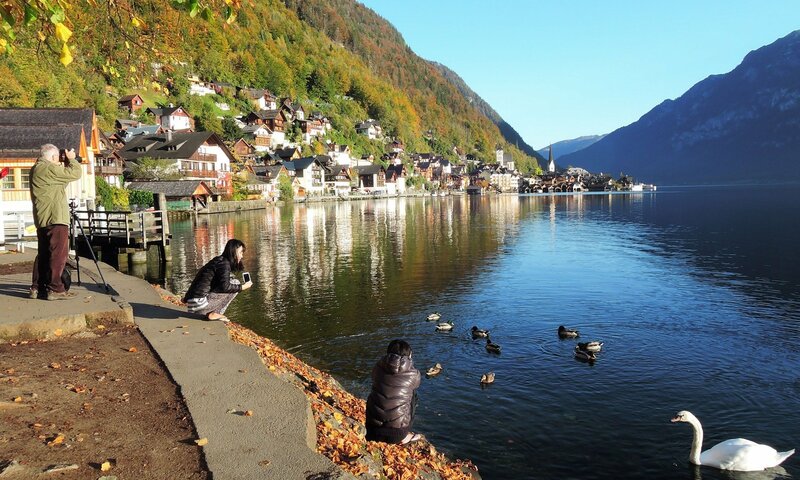 ★Travelers’ Pick: For the best experience in Hallstatt, stay at a hotel right by the lake. The best hotel among the lakeside options is Seehotel Grüner Baum. It offers panoramic views of Lake Hallstatt, a historic ambience, as well as spacious rooms and wonderful staff. If you’re driving, don’t worry that it’s right in the middle of car-free Hallstatt – you can park at the P1 parking area outside town and ride the free shuttle to the hotel. Double rooms start at EUR 175. Other highly-rated hotels in Hallstatt include: Heritage Hotel Hallstatt (double rooms start at EUR 170), Gasthof Pension Hirlatz (double rooms start at EUR 120), and Gasthof Bergfried (double rooms start at EUR 90). For small groups (3-4 adults), check out W & S Executive Apartments (suites for 4 start at EUR 380). Note that both this and the Gasthof Pension Hirlatz are a few minutes’ scenic walk outside the old town. ★Travelers’ Pick: Seehotel am Hallstätter See is the best lakeside hotel on the Obertraun side of Lake Hallstatt. You’ll be treated to the same gorgeous mountain and lake views at an excellent price. Double rooms start at only EUR 75. W & S Executive Apartments also has suites in Obertraun, so for big groups who are really into skiing or hiking, check this out. Apartments start at EUR 100. You’ll hardly need a map while in Hallstatt, but here’s one to help you plan your trip. Hallstatt shares its designation as a UNESCO World Heritage Site with Dachstein. Together, the Hallstatt-Dachstein landscape is deemed “exceptional as a complex of great scientific interest and immense natural power that has played a vital role in human history reflected in the impact of farmer-miners over millennia, in the way mining has transformed the interior of the mountain and through the artists and writers that conveyed its harmony and beauty.” Obviously, the UNESCO reviewers fell in love with these alpine towns as well. You’ll find more breathtaking views in Dachstein, including the glass-bottom 5 Fingers viewing deck and the Dachstein Ice Cave. It’s also ideal for skiing in the winter and hiking in summer as the mountains are famous for their large glaciers. You’ll also find a network of caverns and frozen waterfalls – a natural theme park of all amazing landscapes. Read more about Dachstein here. If you’re passing by Hallstatt on the way from Vienna to Salzburg, check out these other great stopovers to add to your road trip. In a project called “Memory of Mankind,” Martin Kunze stores human knowledge in ceramics and buries it in the world’s oldest salt mine. The reasons and sentiments behind the Chinese copy of Hallstatt. If you love fairytale towns, here are more destinations to add to your European itinerary. Lying between Prague and Salzburg, Cesky Krumlov is a magnificently restored medieval castle town built on the meanders of the Vltava River. If you want to drive from Vienna to Prague (or vice versa), follow this loop: Vienna – Hallstatt – Salzburg – Cesky Krumlov – Prague. Make sure to stop by the little towns along the way! An hour north of Vienna is the Czech Republic’s luscious wine region, South Moravia. In the middle of the rolling fields and vineyards, you’ll find Mikulov, a castle town that’s a great base for biking and hiking adventures, and lots of good wine. Another village in a wine region on this list, Eguisheim is the cradle of wine-making in Alsace, France. Half-timbered houses and flower-lined canals will bring you right into a Hans Christian Andersen bedtime story. Speaking of picturesque canals, a one-hour road trip from Amsterdam will bring you to Giethoorn, a beautiful village connected by bridges that you can only explore on foot or on boats. This is another one that’s straight out of a painting! Not exactly a little town, but if you’re traveling to Austria for the first time, the country’s glorious capital is not to be missed! I hope this helps you plan your trip to Hallstatt. If you’re heading there soon, I cannot be anymore envious! Hallstatt is seriously one of my most favorite places in Europe and would love to visit again and again. If you have any additional information or questions, let me know in the comments. If you found this useful, make sure to bookmark and share so others can see it, too. Thanks for reading and happy travels to Austria! LOVE HALLSTADT … have bin there ( from Calgary Canada) at least 3 times … would go there again anytime! I feel the same! The first time I went there I had wanted to go back as often as I could! I love Hallstatt! Definitely will be coming back! What a great blog post! Hallstatt is so beautiful and your pics are amazing. I’m sharing the same feeling with Martina.